Wahama unior Rachel Roque awaits a pitch during an April 11th doubleheader at River Valley. 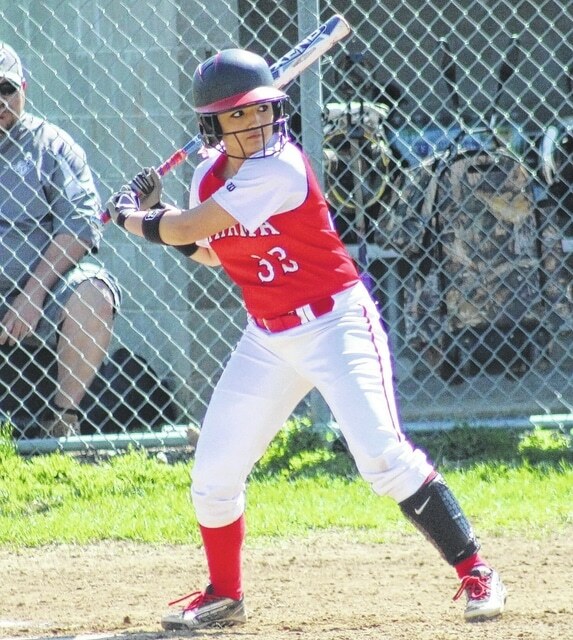 PARKERSBURG, W.Va. — The West Virginia Sports Writers Association recently released its 2015 Class A All-State softball teams. The lone Mason County representative was Wahama junior outfielder Rachel Roque. Roque helped the Lady Falcons to a 12-18 record this season, which ended in the regional semifinal with a loss to eventual state champion Buffalo. Lady Bison senior pitcher Ali Burdette was named first-team captain, Wirt County freshman catcher Skylar Bogan was named second-team captain. P — Linda Hall, Cameron, Sr.
P — Riley Bennington, Wheeling Central, Fr. P — Kati Gasvoda, Madonna, Fr. IF — Sydney Bennington, Wheeling Central, Sr. IF — Emrie Gray, Williamstown, Sr. IF — Tori Stout, South Harrison, So. IF — Olivia Dunn, Buffalo, Sr. IF — Tess Fallova, Bishop Donahue, Sr.
OF — Courtney Allen, Buffalo, Sr.
OF — Stone Cheuvront, Wirt County, Sr.
OF — Rachel Roque, Wahama, Jr.
UTIL — Kora Younts, Richwood, So. UTIL — Abbey Ammons, Clay-Battelle, Fr. UTIL — Kaitlyn Sisler, Fayetteville, Sr.
UTIL — Ashley Mordan, Notre Dame, So. C — Chase Christy, Buffalo, Jr.
C — Allie Cook, Wheeling Central, Jr.
P — Sydney Lipscomb, South Harrison, So. P — Cierra King, Williamstown, Sr.
P — Taylor Townsend, Pendleton County, Fr. P — Brooke Riggleman, Moorefield, Sr. IF — Meredith Lauderdale, Greenbrier West, So. IF — Abbey Durig, Magnolia, Sr. IF — Jordan Lewis, Sherman, Sr. IF — Dakota Reed, Doddridge County, Sr. IF — Brooke Persinger, Buffalo, Fr. OF — Demi Smallwood, Richwood, Sr.
OF — Caitlyn Berardi, Cameron, Sr.
OF — Ashton Chancellor, Williamstown, Sr.
UTIL — Chelsea Gale, Huntington St. Joe, Jr.
UTIL — Taylor Cosper, Paden City, Jr.
UTIL — Bailey Wood, Cameron, Sr.
UTIL — Olivia Ooten, Tug Valley, Sr.
C — Sydney Keffer, Man, So. Talia Corbett, Charleston Catholic; Sommer South, Bishop Donahue; Mady Hardbarger, Wirt County; Aubrey Neff, Paden City; Ashton Chancellor, Williamstown; Hayley Wanstreet, Gilmer County; Mikala Keplinger, Doddridge County; Jersey Thompson, Valley-Fayette; Lora McDonald, South Harrison; Katie Shaffer, Notre Dame; Megan Chambers, Richwood; Savannah Mullins, Meadow Bridge; Madison Syner, Midland Trail; Kailey Cooper, Valley-Fayette. Paige England, Buffalo; Elise Peden, Charleston Catholic; Kendra Becker, St. Marys; Courtney Dotson, Williamstown; Kayla Randolph, Wirt County; Jordan Fox, St. Marys; Maddie Pride, Clay-Battelle; Hanna Burnside, South Harrison; Cheyenne Currey, Doddridge County; Marion Emerson, Notre Dame; Molly Wheeler, South Harrison; Alexa Roles, Fayetteville; Shaedyn Housh, Greater Beckley Christian; Brittany Bevins, Greenbrier West; Morgan Amick, Richwood; Shaely Redden, Meadow Bridge; Makenna Nickell, Midland Trail; Kiki Peterson, Greater Beckley Christian; Taylor Thompson, Madonna.